Another interesting thing has surfaced in the “Sundry Contracts” boxes, something that really made me stop and think. It’s a waiver, executed in 1933 by a former Rice employee. He had worked for Tony Martino on the grounds crew and left after an injury. Here’s what’s interesting: he, his wife and their two children were living in “the little house on the Institute campus, near the mule stables.” This is the first I’ve ever heard of either a little house or any mule stables on the grounds. But of course it makes complete sense. There are dozens of photographs of mules (and horses) at work on campus. 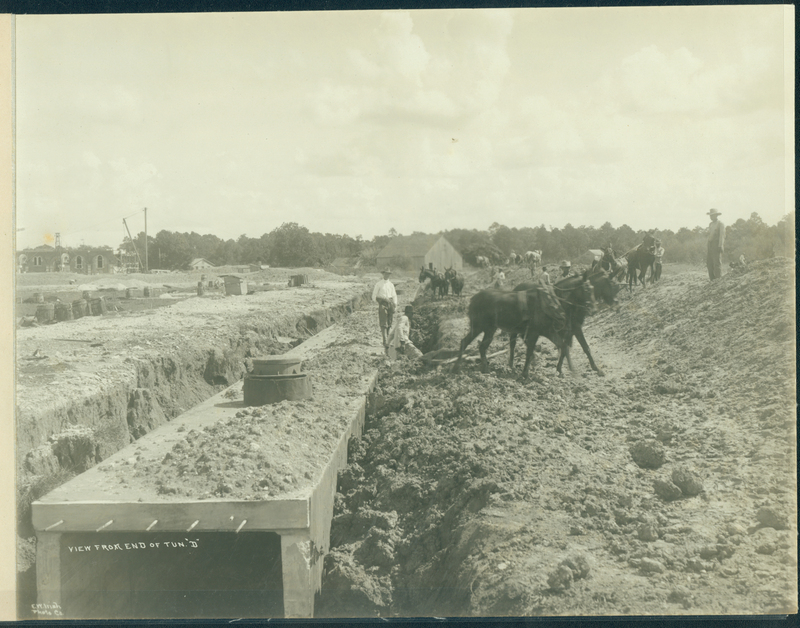 They are pulling wagons, mowers, plows, and other construction equipment in pictures dated from the earliest days of the Institute until at least the end of the 1930s. They had to have lived somewhere. Attached to the waiver was a fascinating drawing. 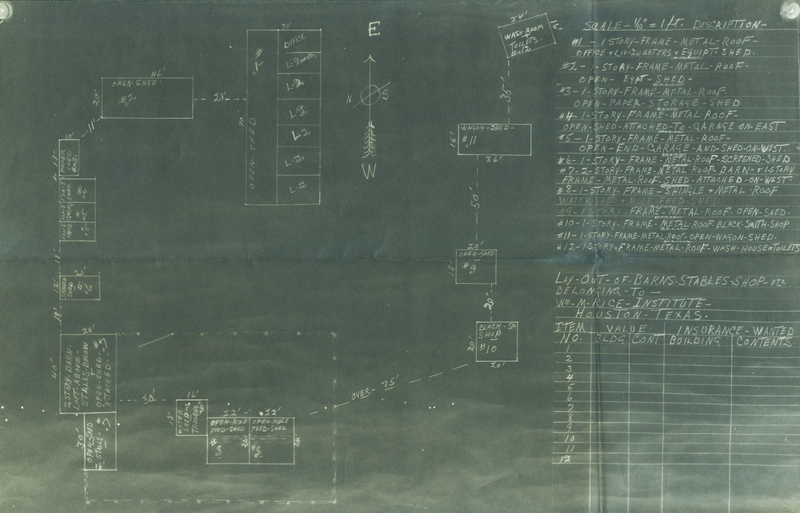 It’s a blueprint, so it’s bit difficult to read but I’ll post it anyway. (If you click on it, you’ll get a bigger version that’s much clearer.) It shows a pretty elaborate set of buildings for the care and housing of this livestock, including a horse barn with a loft, several mule sheds, watering areas, and a blacksmith shop. It’s an impressive set-up and I can only wonder how I’ve managed to miss its existence until just now. Still to be determined: where the heck were these buildings?? How long did they stand? When did we last use mules? There isn’t a place I can just go to look this up, but I’ve already started scrutinizing pictures in a new way, thinking about these questions that hadn’t occurred to me until now. The waiver, by the way, allowed the family to keep living in the Institute’s house even though he was no longer employed there. He fed and watered the mules in lieu of rent. Start with the budget. When is the last time we budgeted for a blacksmith, feed, or mule managers? When did fuel become a bigger component of the budget than feed? Interesting note. We don’t have the budget! What has survived is almost completely random. I’m just about to write a post about this. In the bluepring, upper left corner is a “Paper shed”. Who knos what that was? In the upper photo of the “tunner”, what building is being constructed in the background, perhaps Lovett Hall? Melissa, do you notice that I can’t type properly during the daytime. Does that prove that I’m a true OWL? My name is Emily Medrano. I am the granddaughter of Mr. Jose Garcia, Mr. Martino’s right hand man during this time. My grandfather lived in the house you are referring to with his wife, Emilia, and their children…and yes he was injured on the job. Please contact me if you would like further information about the house, the mule stables, the gully, etc. My mom and aunt would be so excited to hear from you.